Stanley H. Appel, MD is Co-director of Houston Methodist Neurological Institute, chair of the Stanley H. Appel Department of Neurology and the Peggy and Gary Edwards Distinguished Chair in ALS at Houston Methodist Hospital. He also is Professor of Neurology at Weill Cornell Medical College. An internationally renowned researcher and neurologist, Dr. Appel is dedicated to the treatment of patients with ALS and is one of the nation's foremost experts on the disease. He has spent more than 40 years devoted to understanding the human brain. Dr. Appel is creator and director of what is now the Houston Methodist Neurological Institute's MDA/ALSA ALS Research and Clinical Center in Houston. Established in 1982, the center was the first of its kind dedicated to ALS patient care and research in the United States. Dr. Appel's laboratory focuses on developing new insights into ALS, Parkinson's disease, and Alzheimer's disease, and was the first to document regulatory T-lymphocytes modulate disease progression in ALS patients. His focus is on enhancing the protective immunity of T-reg cells and anti-inflammatory microglia in neurodegeneration. Dr. Appel has written 15 books and more than 400 articles. 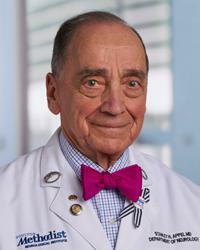 His achievements include the Gold Medal for Excellence in Biomedical Research from Columbia College of Physicians and Surgeons, Sheila Essey Award for ALS Research, Texas Neurological Society Lifetime Achievement Award, Forbes Norris Award from the International Alliance of ALS/MND Associations and John P. McGovern Compleat Physician Award from the Houston Academy of Medicine.